Get all the details in this free constantly updated Master Twitter Chat Party Calendar listing tons of family friendly parties including specifics on prizes you can win and links to RSVP and participate. Includes Twitter Parties in the U.S. and Canada. A new weekly Twitter Party Schedule is published every Sunday at 9 am ET. Be sure to check back often during each week as new events are added on an ongoing basis -- often with new prize-winning opportunities added several times per day. You'll also get a sneak peek at Twitter parties coming up next week and in the month ahead. Now listing Facebook, Pinterest and Google+ parties with prizes too. Be the first to know when the latest Mommy Blog Expert Twitter Party schedule goes live by following MBE on Twitter, Facebook, Pinterest, Instagram, Google+ and/or subscribe now. Stop Your Burn Twitter Party at 8:30 pm ET with @waterjeltech @joyofkosher @joyofkoshermag @jamiegeller @tamargenger @mommyblogexpert. Prizes: TBA. Watch #StopYourBurn hashtag, RSVP link to be posted here soon. Winn Dixie Rosh Hashanah Kosher Twitter Party at 8:30 pm ET with @joyofkosher @joyofkoshermag @jamiegeller @tamargenger @mommyblogexpert. Prizes: TBA. Watch hashtag #WinnDixieKosher, RSVP link to be posted here soon. FTC Disclosure: MommyBlogExpert does attend some Twitter parties as a guest and also works as a consultant, host, co-host, and/or panelist for others. Except for the #StopYourBurn Twitter Party on 8/17/15 and the #WinnDixieKosher Twitter Party on 8/31/15, I am not receiving payment or compensation associated with any party on this calendar. See complete FTC disclosure information that appears at the bottom of MommyBlogExpert's main page and at the bottom of every individual post on this blog, including this one. Wow! 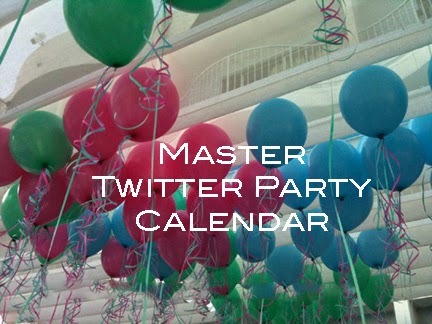 You've got a bunch of Twitter party opportunities listed here. I have to confess, that Twitter parties make my eyes bounce around in my head like a cartoon character. They're a bit overwhelming for me, but I've meaning to try a couple again soon. I am still learning how to be apart of twitter parties. You have some great ones listed here. I can see a few that I need to write in my calendar. I'll have to check out one of these twitter parties. It will be a fun new venture!! !